You can’t do Annie without an amazing young actress in the title role. Well, we have two of them! We are so excited to introduce Annabel Feigen and Rieleigh Smith, the two incredible girls taking on the most famous orphan in Musical Theatre history. We sat down for a chat about dogs, the show and working at the Mac-Haydn. Rieleigh Smith with our Sandy (Mattie). Have you performed Annie before? Annabel: I have never been in Annie before but I have loved the musical since I was a really little girl. It was one of the first Broadway shows I saw when I was five and before that I watched the movie all the time. I even had an Annie-themed birthday party for my 4th birthday! When I saw that the Mac-Haydn Theatre was doing it this summer I begged my parents to let me audition and my dream came true! I couldn’t be more excited! 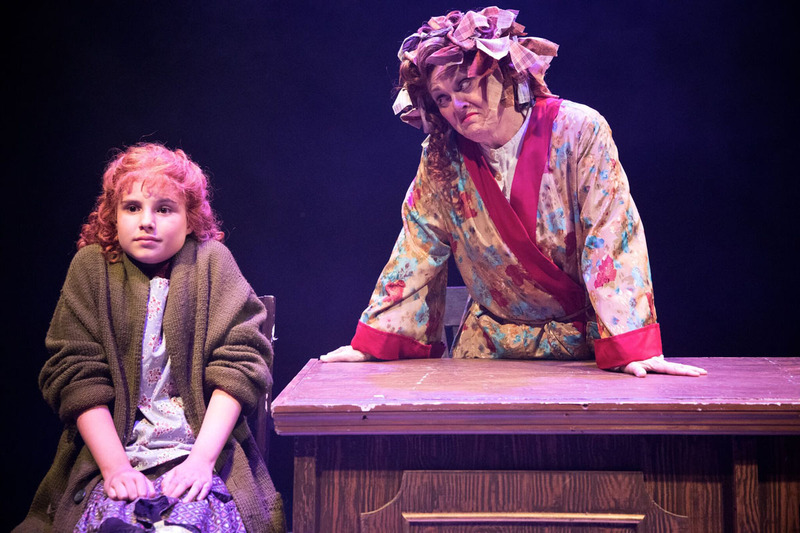 Rieleigh: I have performed as Annie about a year ago in East Greenbush (SYFI Productions) and it was really fun to finally be in Annie, as Annie! I was so excited. Are you a dog lover and how is it working with Mattie on this production? Annabel: I love dogs but my mom isn’t really a “dog person” so we don’t have one. I am really excited to work with Sandy (Mattie) because I’ve never worked with any animals in a show before. She’s really cute! Rieleigh: I am a huge dog lover. I have two dogs at home. I also love working with dogs because they are so much fun to be around and it really makes the audience happy when they see a dog come out on stage. Annabel with Warbucks (George Dvorsky) and Grace (Corrinne Tork). What is your first memory of being on stage? Annabel: When I was five and cast as a salt shaker in Beauty and the Beast Jr. It felt so cool to be up on a “big” stage with “big” kids. I remember wanting to stay for all of the rehearsals even when I wasn’t called! Rieleigh: When I was seven years old I played a Spoon in Beauty & the Beast. I had seen a few shows before and thought that being onstage would be lots of fun. I was right and have kept doing shows ever since. Who are some of the artists you look up to and respect? Annabel: The first musical theatre artist I fell in love with was Julie Andrews! I watched the entire movie of the Sound of Music every day from the age of 2 1/2 to 3 1/2, (I had a lot of free time before going to pre-school) and then moved on to Mary Poppins! I think Kelli O’Hara is incredible. I love her voice and her acting. I also currently adore Christy Altamore from Anastasia and Taylor Louderman from Mean Girls. And I still can’t get over Ben Platt’s performance in Dear Evan Hansen! Rieleigh: I love to watch the artists from productions like Newsies! who can really dance and sing. I really look up and respect some of the older kids I do theatre with who are such good role models to me. Rieleigh with Ms. Hannigan (Monica Wemmit). Any fun impressions of working at the Mac-Haydn so far? Annabel: Everyone is so nice and friendly! In the first week all of the orphans in Annie got to shave Daddy Warbucks head on the stage! Where else can you do something like that??? Rieleigh: The Mac-Haydn stage is so different from what I have ever performed on and I wondered how we were going to stage Annie! It has been so much fun, we even got to shave Daddy Warbuck’s head! I can tell that everyone from Mac-Haydn is very nice and talented and that the show is going to be amazing.